Where should you go when shopping for tires? Look no further than Harris Mazda in Nanaimo, BC. The Mazda Tire Centre is your source for tires with top named brands like Goodyear, Dunlop, Pirelli, Michelin, BFGoodrich, Uniroyal, Bridgestone, Firestone, Yokohama and Toyo. Mazda engineers go to great lengths to design and test each and every component of your Mazda vehicle to provide the optimum driving comfort, safety, performance and handling. Tire selection is no exception. That’s why we recommend that you replace the tires on your vehicle with same tires used during production. Also consider that with proper care and under optimum driving conditions the tires you purchase will last tens of thousands of kilometres. Making the wrong tire selection for your driving needs could result in an unfavourable driving experience over a period of several years. Regardless of your reasons, here are a few tips that must not be overlooked when considering your tire selection. Your owner’s manual or the label usually found in the driver’s door opening and sometimes inside the glove box door will specify the correct size of tire for your vehicle.In the example to the right, the correct load and speed rating for this 2006 MX-5 is 84W. 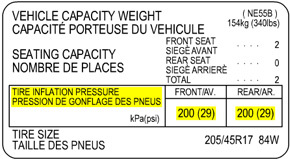 The load and speed rating indicate the ability of the tire to carry a load and dissipate heat when properly inflated. The load and speed ratings on replacement tires should only meet or exceed the recommended load and speed ratings for your vehicle. More and more, Canadian drivers are making the decision to install winter tires on their vehicles. While all-season tires may get you through the winter they are no match for a tire designed exclusively for winter use. The tread on winter tires is specially designed for improved traction in snow and/or icy conditions as well as for the evacuation of water through the tread to help prevent hydroplaning on wet slushy roads. The specialized rubber and construction materials are also specially designed for improved starting, stopping and cornering in cold temperatures. At 7 degrees Celsius an all-season tire starts to lose its grip on dry surfaces and this trend continues as the temperature drops. At the same temperature a winter tire’s performance is significantly improved over that of an all-season tire.Winter tires are not just for driving on snowy, slushy roads they are designed especially for all winter driving conditions. Winter tires are not just for driving on snowy, slushy roads they are designed especially for all winter driving conditions. Winter tires are not recommended for use in late spring, summer or early fall as the rubber compound will wear very quickly if used when the projected daytime temperatures are 7 degrees Celsius or above. Many Mazda dealers offer steel wheel packages mounted with winter tires. Having winter tires mounted on steel wheels makes switching between seasons a breeze and helps prevent deterioration of your alloy wheels from salt, sand, stones, etc. used on winter roads and highways.